A few days ago I decided to make potholders as Christmas presents. I decided to be spontaneous and use all of a 36 piece charm square packet I purchased a few weeks ago from connectingthreads.com. The packet was called “Good Neighbors”. I threw caution to the wind, and didn’t use a pattern! So here is the result. They are bright and happy, and I hope they fit well into the receivers’ kitchens. The charm pack made eight potholders. Onto a large piece of backing, I placed one layer of Insul-bright and one layer of 100% cotton batting. Pinned all of the potholders down and then straight-line quilted with a walking foot. The backing is a dark gray essex linen-blend. Almost forgot. The new technology part is the WordPress app that I just added to my phone and which I’m using to create this post. It’s encouraged me to make a post to my blog which is long overdue. But I’m having a lot of difficulty posting and captioning the pictures. So I’ll save my draft – and finish it on the main computer. And probably not with my new Windows 10 laptop either, which I’m also having difficulty understanding. It’s amazing how much time technology can take away from sewing! Oooh I like your blog! I am going to follow it! I am now thinking about making some potholders! Thanks for your informative writing. Back pain is very common matter for human. If you want to know more things about Quilts & Coverlets . I think that is very informative details for you. Bright and cheery indeed! 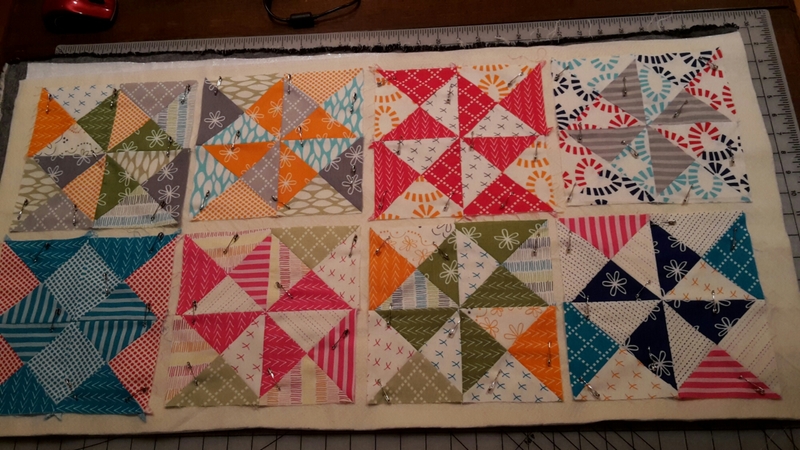 I like the idea of quilting them all on one back and batting–seems a time saver. Lovely! I love straight line quilting! thank you! I love that it is within my skill range and seemed appropriate for these visually ‘busy’ potholders.